1) Shah Rukh Khan received Global Diversity Award: Bollywood superstar Shah Rukh Khan has been honoured with Global Diversity Award 2014 by British parliament for his contribution to cinema. 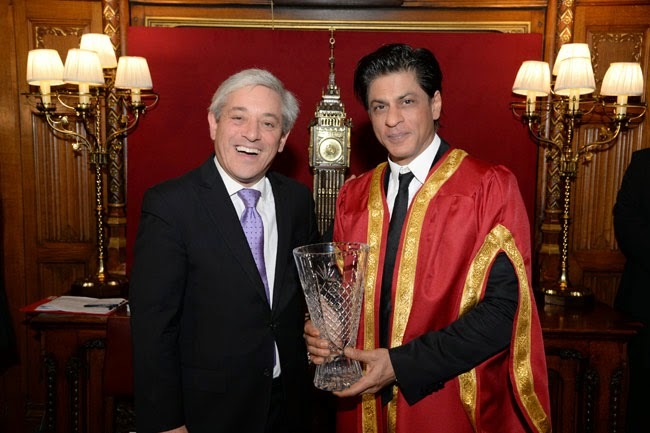 House of Commons speaker John Bercow presented the award to Shah Rukh Saturday. "Now (in) parliament to receive the Global Diversity Award... Humbled and grateful. Thank you," he tweeted before the ceremony. The past recipients of the award include megastar Amitabh Bachchan, former beauty queen and actress Aishwarya Rai and Hollywood actor Jackie Chan. 2) Modi pays tribute to freedom fighter Shyamji Krishna Varma: Prime Minister Narendra Modi Saturday paid tributes to freedom fighter Shyamji Krishna Varma on his 157th birth anniversary, urging people to visit his memorial. "On his birth anniversary, I bow to Shyamji Krishna Varma. A devout patriot, he inspired several nationalists, both in India and overseas," the prime minister said in a tweet. He added that Varma was closely associated with India House, which was a very active hub for the nationalist movement in London. Varma was a freedom fighter hailing from Gujarat. He was was born Oct 4, 1857 in Kutch. 3) President, PM greet nation on Eid-ul-Azha: President Pranab Mukherjee and Prime Minister Narendra Modi Sunday greeted the nation on the eve of Eid-ul-Azha and urged people to imbibe the spirit of love and service. "I convey greetings and best wishes to all fellow citizens, especially my Muslim brothers and sisters," the president said in a statement. "Let us imbibe the spirit of universal love, brotherhood, sacrifice and service which constitute eternal values always upheld by our composite culture and work unitedly for peace, progress and prosperity of our nation and the world," he added. "Eid-ul-Azha symbolizes sacrifice, faith and devotion."